In today’s guide I’m going to walk you through the basics of buying a new golf club set. We will be covering the different components of the golf club as well as what golf clubs should be included in your set you purchase. This will help you learn what to look for, what to avoid, and what you need to fit your playing ability so you can make the right purchase decisions. Marketers would love to sell you on the wrong golf equipment so get ready for an in-depth education guide on buying golf clubs! 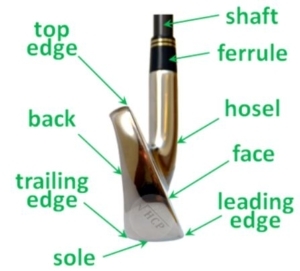 Let’s start off reviewing the basic components of a golf club! 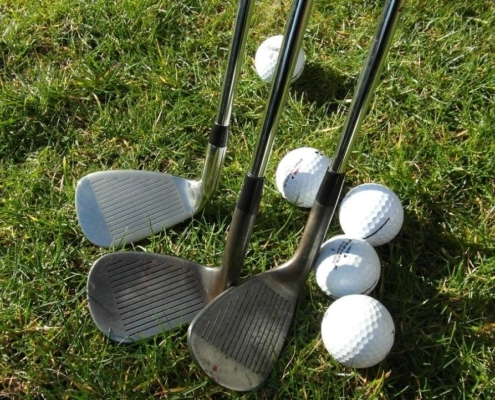 In order to hold onto a golf club, there is an eight-inch rubber grip that is glued onto the steel or graphite shaft of each golf club in your bag. This gives your hands something to hold onto so the club doesn’t slip out of your hands as you are swinging 80-120 mph. Grips come in different sizes as well; standard, midsize, and oversize. When should each be used? If you have bigger hands you may benefit more from a thicker grip. Or on the putter, for example, thicker grips are common to help golfers keep their hands and wrists less active during the putting stroke. Grips also come in many textures, colors, and designs. You can start with the standard grips that come on your golf club set and if they don’t feel comfortable, you can always switch them out by buying custom grips. The shaft is the cylindrical “pole” that connects into the club head. Club shafts are usually made of stainless steel, graphite, or other metals depending which golf club they are being used for. Most drivers, for example, are shafted with graphite material which is lighter weight to help the club be swung faster. Another component of shafts is the flex. When a club is swung at fast speeds, the shaft flexes from the wind resistance and when the golf club head strikes the golf ball, the shaft flexes as well creating a whipping effect to generate speed into the ball. Your swing speed will usually determine the level of flex stiffness needed which can very from “L” for ladies, “A” for amateur/senior, “R” for regular, “S” for stiff, and “X” for extra stiff. Regular flex is most common but beginners, women, and senior golfers with slower swing speeds may benefit more from “L” or “A” flex shafts. 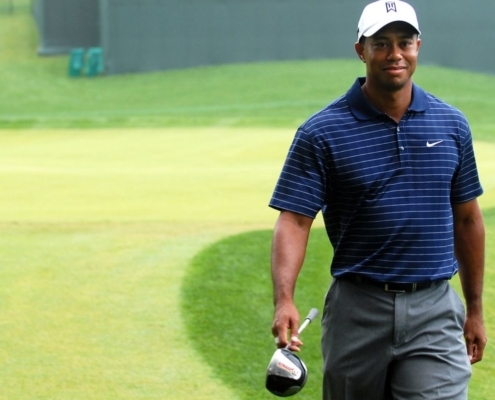 High speed swings like professional players often find a stiffer shaft works better for them. Picking the right shaft flex to match your golf swing can help you hit the ball longer and under better control so it’s recommended seeing a club fitting professional if you have questions! The hosel is important because it connects the clubhead to the shaft. It also determines the lie angle of the club which is the angle between the sole of the club and the shaft. Certain golf clubs like drivers, fairway woods, and hybrids offer adjustable hosels which allow you to change the loft settings of the club. Irons, wedges, and putters usually do not have adjustable hosels as the clubs are built with preset lie angles suited for that specific golf club. Depending on your height and your swing you could have your golf clubs adjusted to lie angles that custom fit you best. This is common among professional golfers who may differentiate their club settings from the standard club settings that the average golfer would buy from the store. Our final component to discuss is the clubhead. 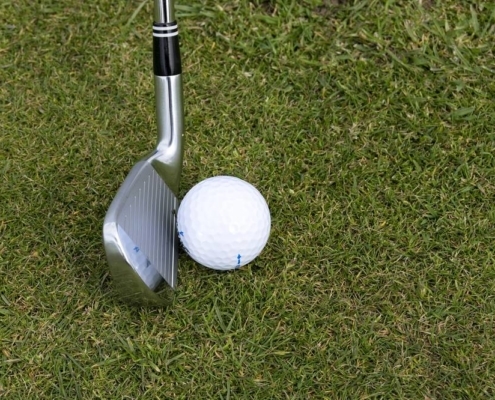 Clubheads are designed for launching the golf ball into the air when they make contact with the ball. Loft is ultimately what controls your ball’s flight trajectory. Different components of the clubhead can be summed up in this image of this driver but they also apply to woods, hybrids, and irons. Overall, the clubhead is what moves the ball from the tee box to the green and the manufacturing companies (TaylorMade, Cobra, Titleist, Callaway) work hard to optimize the club head design to help it hit the ball longer and straighter. Here is a YouTube video explaining the design process of golf clubs if you’re interested in checking it out for further information. Now that you understand the components of a golf club, let’s review the different types of golf clubs that should come in your set of clubs. 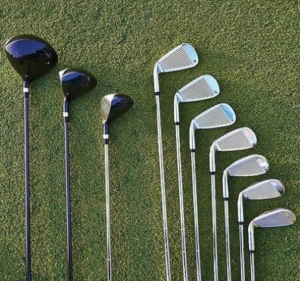 A driver is often the most coveted club in the golf bag that players put most of their focus on when buying golf clubs. This is largely due to the distance it can hit a golf ball and the golfer’s ego pushing them to try and hit the ball as far as possible. A driver comes in loft degree options between 9 and 13 with most club manufacturers producing a 9, 10.5, and 12 degree options. However, you can check to see if they’ll produce the driver in 8 degree or 13 degree options as well if one suits your game better than the standard three loft options. Drivers can hit the ball 200-350 yards on average which is important for longer golf holes like par 5’s and long par 4’s. But they are also one of the most difficult golf clubs in the bag to hit which means picking out one that is also forgiving. According to Fujikura, drivers are built with steel and graphite shafts and the clubhead is produced most often in aluminum or alloy materials. Carbon fiber is also occasionally used as a driver’s clubhead material since it’s lighter weight. You’ll also notice that drivers have larger club heads giving them a bigger sweet spot to make contact with the golf ball. You can choose between head sizes but the standard size of drivers these days is 460cc (cubic centimeters) which is the maximum allowed by the USGA currently. Swing speed is fastest with the driver due to the shaft length and design of the club. Most golfers range between 80-120 mph swing speed with their driver. An average player with a 95 mph swing speed may hit the ball 230-240 yards, for example. In the old days of golf, fairway woods were actually constructed of wood. Today you’ll find most are actually “fairway metals” due to the stainless steel, aluminum, and other alloys that are used to construct them but still commonly referred to as “fairway woods”. Fairway woods have different loft options and you can choose to have multiple woods in your club set if it helps you cover the distance gaps needed in your golf game. The 3 wood is a 13 degree club loft, the 5 wood is a 15 degree loft, and the 7 wood is a 17 degree loft. An easy way to remember this is to just ad a “1” in front of it for the degrees loft. Beginner golfers tend to perform better with a wood as opposed to their driver so it’s pretty common to carry a 3 wood in your bag for tee shots in addition to using it for fairway shots on long par 4’s and par 5’s. After the 3 wood, you may choose to have a 7 wood to cover the next distance gap between a 3 wood and a hybrid (19-21 degree loft) or 4 iron. For example, on long par 3’s that stretch 200 yards, a hyrbid or 7 wood could be used if it’s easier to hit than trying to hit a 4 iron 200 yards. Hybrid clubs are important to bridge the gap between your woods and your shorter irons, if you struggle to hit longer irons. Most beginner’s don’t make the best contact with a 3 or 4 iron and therefore struggle to get much distance with it. These long irons are also tough to keep straight for most beginner players with slices and hooks being the most common shot tendency. Replacing the 3 and 4 irons with hybrids can ease playability and make your swing more forgiving on off-center golf shots. Irons are important for scoring well in golf. 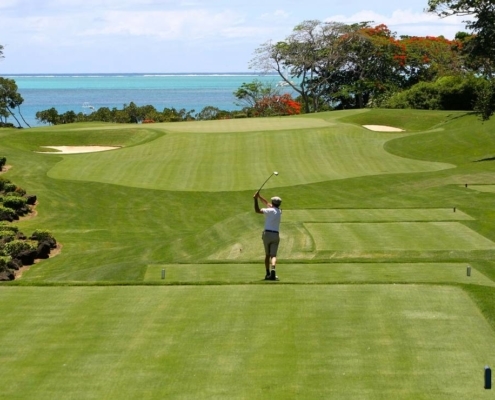 Golf course’s design most greens to be quite small and with various ridges and slopes. This makes it tough for a golf ball to stay on the green if you hit a line drive with a wood or driver, for example. Irons are able to hold the ball on greens by producing lots of backspin on the golf ball thanks to the grooves on the club face. If backspin is over done, your golf ball can also spin back off the front of the green since most greens slope from back to front but this is a more common problem for professional golfers who generate higher spin rates than the average player. Most iron sets come standard with the 4-iron, 5-iron, 6-iron, 7-iron, 8-iron, 9-iron, and Pitching Wedge. Additionally, they may have a Gap Wedge or Approach Wedge as part of the 8 club iron set. Some iron sets substitute a 3-iron in replace of the G or A Wedge. Most iron sets come with either steel or graphite shafts. For beginners, women, and senior golfers who tend to have slower swing speeds, a graphite set of irons is recommended to help you launch the ball better. The clubhead on the iron is often cavity backed to allow more forgiveness for beginner golfers but more skilled golfers can opt for blades or other head designs. 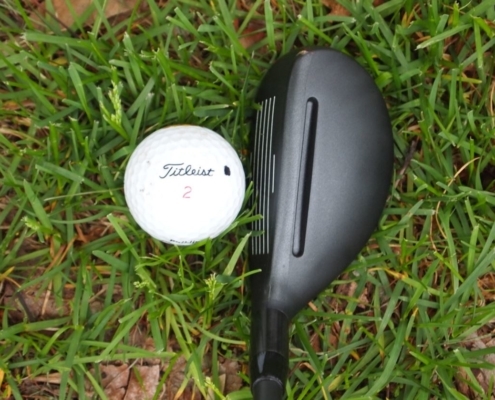 The clubhead is also much thinner and smaller as compared to woods and drivers which helps improve your accuracy. The lofts increase as the number on the iron increases. For example, your 9 iron has more loft than your 4 iron which means the 9 iron will hit the ball higher than the 4-iron and also be easier to control shot shape than the 4-iron. But for this improved control and accuracy, the 9-iron gives up distance which is why having a complete set can cover you over a wide range of distances you’ll face on the golf course. Wedges are designed for improving your scoring as you get close to the green. They are created with higher loft that produces more accuracy and higher spin to help you get more control over the golf balls distance. Bounce is another factor to consider when picking out wedges in your club set. It’s measured via the angle from the leading edge of the wedge’s club face and the bottom of the sole. The higher this angle is, the more bounce the wedge has and easier it is for the wedge to bounce off of the ground (as opposed to digging into the ground). To help your chip shot produce consistent results, bounce can help the wedge continue moving forward in your swing after contacting the ground so that no jabby or jerky movement occurs, causing the ball distance to be inconsistent. The gap wedge “bridges the gap” between your pitching wedge and your sand/lob wedges. According to LeaderBoard Golf, the gap wedge has 50 degrees of loft to help with shots from 90-120 yards as well as bump and run style chip shots around greens. Lob wedges can vary from 54-64 degree loft. Phil Mickelson is famous for carrying a 64 degree lob wedge to hit high arcing flop shots out of sand bunkers and around greens. Assuming you have a driver, wood, 8 irons in your iron set, and a putter, this puts you at 11 clubs total leaving 3 more club slots which could be 3 different wedges (54, 58, and 62 degrees loft). Short game makes up a large percentage of your strokes so having a good combination of wedges can help you pull off a variety of shots around the green. Last but not least is the putter which can arguably be your most important golf club in the bag since it actually puts the ball into the hole to end your score for the hole. There are many different styles of putters so the first step is understanding your putting stroke and matching it with a putter that is designed for your putting stroke type. 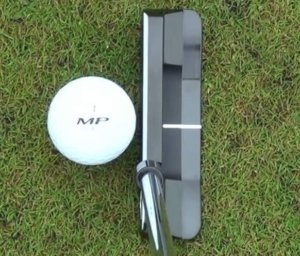 For example, if you keep your putting stroke fairly straight back and straight through, you may benefit most from a face-balanced putter according to GolfTec. However, golfers with arcing putting strokes that open and close during the stroke tend to benefit more from a toe weighted putter. This extra weight in the toe can help them square the face at impact to start the putt on line. In addition to weight distribution options you also get to choose head design style. Whatever your experience with golf, an indoor putting green can also be great for improving your short game. Blade Putters have a smaller head design and thinner which make them ideal for players who are fairly accurate with putting. 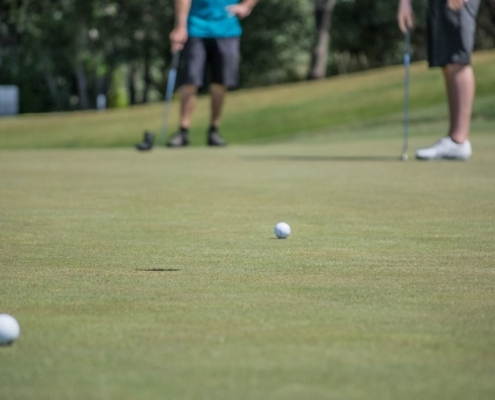 Think of the putter you’d use during miniature golf at a putt putt course. Mallet Putters are a much larger head design, often in a square block shape but also come with fangs or rounded edges on the back of them. These are ideal for players who need alignment assistance due to the shape and forgiveness on mishits due to the heaviness of the putter head. What to Look for in a Beginner Set of Golf Clubs? Golf club sets are composed of 14 clubs which is the maximum legal amount allowed by the USGA. In a beginner golf club set you should look for a good mix of drivers, woods, hybrids, irons, wedges, and a putter. Most importantly, you want the golf clubs to cover your distance gaps. For example, if you hit your driver 230 yards and you hit your 4 iron 180 yards, then this 50 yard distance gap needs to be covered by the proper mix of fairway woods and hybrids with different lofts. Beginners should also look for drivers with more forgiveness and higher loft angles to help them hit the golf ball higher and farther as well as straighter from the forgiveness factor. Here is a cool chart showing the average golf distances each club hits the ball for the average player. How Much is a Beginner Set of Golf Clubs? As a beginner, you don’t need to spend lot of money on a new golf club set. Later as you improve you can upgrade to the newest clubs on the market which also come with a higher price tag. Instead, you’ll be able to find beginner golf club sets ranging from $150 to $400 new or shop the used golf club market and find even cheaper deals. Paying a few hundred dollars for an entire set of clubs is a good deal considering just the driver alone can run as high as $550-$700 these days. 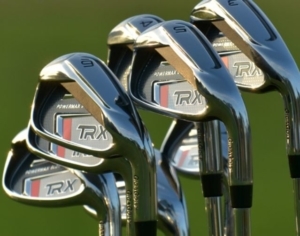 If you were to look into newer golf sets from top brands like Callaway, Cobra, Ping, TaylorMade, and Titleist, you would find that irons sets can range from $699 to $1,999. The tour level iron sets often run the most expensive but are also designed for more skilled players so they’d be challenging for a beginner to play with. They’d fall in line closer to the $1,499 to $1,999 range of the price spectrum.